You'll always have good luck when you carry this pocket token which contains a real preserved lucky four leaf clover. 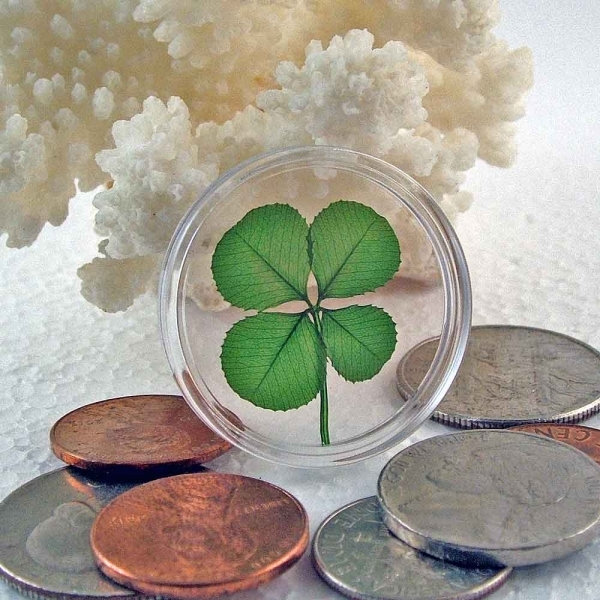 This genuine four-leaf clover has been hand-picked from the white clover plant, Trifolium repens and received a 5 step process which has pressed and preserved the leaf in its natural green color that will last for years. 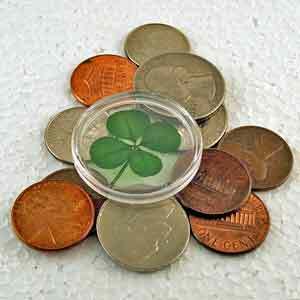 The leaf is enclosed in a 1-3/16" X 3/16" crystal clear coin holder with clover fact sheet. Carry your good luck clover in you pocket, purse or wallet. A great gift for any Golfer, Poker, Bingo, Slots or Gaming player. Also serves as a lucky rubbing stone. Poly bagged with clover fact sheet.